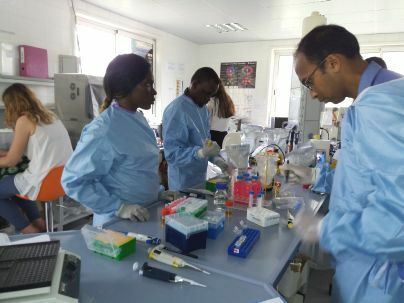 From February 11 to 15, 2019, a working session was held at the Lambaréné Medical Research Center to launch activities for the "FreeBILy" study, which includes Gabon, Madagascar, The Netherlands, and Germany. 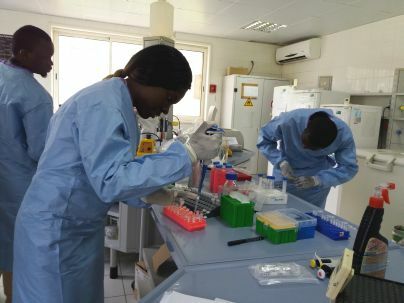 The first part aimed to train biologists and laboratory technicians involved in the study on the principles, procedures and use of the diagnostic tests UCP-LF CAA, SEA antigens, and POCCCA, which are new methods of diagnosing schistosomiasis based on antigens circulating in the blood of infected persons. During the annual meeting which took place from 14 to 15 February 2019, the Madagascar team and Gabon team presented their timelines and milestones, field activities, laboratory preparation activities and discussed the issues and challenges encountered up to now.. This was followed with updates on cost effectivness evaluation, data management, capacity building activities and development of a CAA/CCA dupe test.